Somatic cell nuclear transfer has established that the oocyte contains maternal factors with epigenetic reprogramming capacity. Yet the identity and function of these maternal factors during the gamete to embryo transition remains poorly understood. In C. elegans, LSD1/KDM1A enables this transition by removing H3K4me2 and preventing the transgenerational inheritance of transcription patterns. Here we show that loss of maternal LSD1/KDM1A in mice results in embryonic arrest at the 1-2 cell stage, with arrested embryos failing to undergo the maternal-to-zygotic transition. This suggests that LSD1/KDM1A maternal reprogramming is conserved. 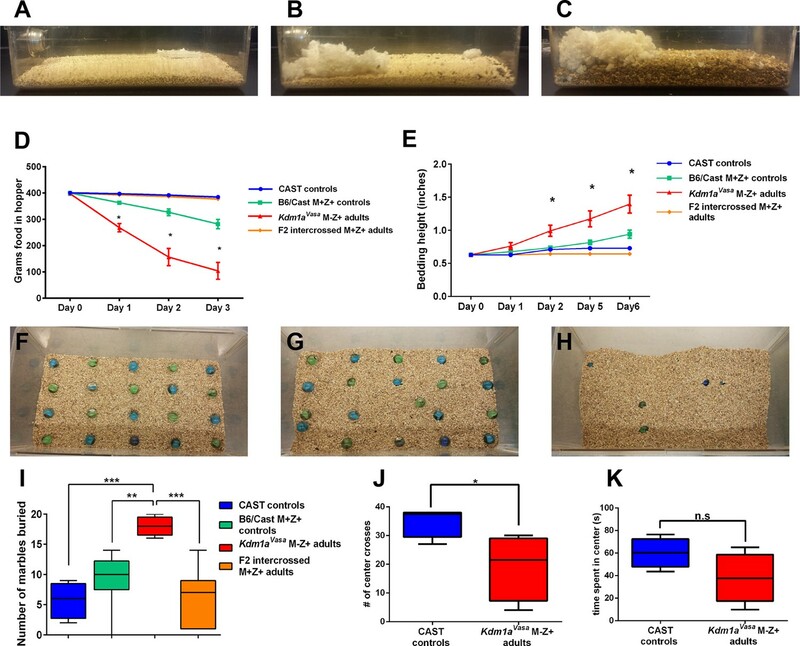 Moreover, partial loss of maternal LSD1/KDM1A results in striking phenotypes weeks after fertilization; including perinatal lethality and abnormal behavior in surviving adults. These maternal effect hypomorphic phenotypes are associated with alterations in DNA methylation and expression at imprinted genes. These results establish a novel mammalian paradigm where defects in early epigenetic reprogramming can lead to defects that manifest later in development. During fertilization, an egg cell and a sperm cell combine to make a cell called a zygote that then divides many times to form an embryo. Many of the characteristics of the embryo are determined by the genes it inherits from its parents. However, not all of these genes should be “expressed” to produce their products all of the time. One way of controlling gene expression is to add a chemical group called a methyl tag to the DNA near the gene, or to one of the histone proteins that DNA wraps around. Soon after fertilization, a process called reprogramming occurs that begins with the removal of most of the methyl tags a zygote inherited from the egg and sperm cells. The zygote’s DNA is then newly methylated to activate a new pattern of gene expression. In mammals, some genes escape this reprogramming; these “imprinted” genes retain the methylation patterns inherited from the parents. Reprogramming is assisted by “maternal factors” that are inherited from the egg cell. Once reprogramming is completed, the maternal factors are destroyed as part of a process called the maternal-to-zygotic transition. A maternal factor called KDM1A can remove specific methyl tags from certain histone proteins, but how this affects the zygote is not well understood. Now, Wasson et al. (and independently Ancelin et al.) have investigated the role that KDM1A plays in mouse development. Wasson et al. genetically engineered mouse egg cells to contain little or no KDM1A. Zygotes created from egg cells that completely lack KDM1A die before or shortly after they have divided for the first time and fail to undergo the maternal-to-zygotic transition. Other egg cells that contain low levels of KDM1A can give rise to baby mice. However, many of these mice die soon after birth, and those that grow to adulthood behave in abnormal ways; for example, they display excessive chewing and digging. These disorders are linked to the disruption of DNA methylation at imprinted genes. The next challenge will be to further investigate the mechanisms by which defects in maternally deposited KDM1A exert their long-range effects on imprinted genes and altered behaviour. This is particularly important because of the recent discovery of three patients with birth defects that are linked to genetic variants in KDM1A. At fertilization, the epigenome of the developing zygote undergoes widespread changes in DNA methylation and histone methylation (Aoki et al., 1997; Arico et al., 2011; Bultman et al., 2006; Burton and Torres-Padilla, 2010; Lindeman et al., 2011; Smith et al., 2012; Vastenhouw et al., 2010; Wu et al., 2011). This reprogramming is driven by the deposition of maternal proteins and RNA into the zygote (Tadros and Lipshitz, 2009). After fertilization, zygotic genes become transcriptionally active, while the maternal transcriptional program is silenced (Tadros and Lipshitz, 2009). In mice, this maternal-to-zygotic transition (MZT) occurs between the one- and two-cell (1-2C) stage (Aoki et al., 1997; Hamatani et al., 2004; Xue et al., 2013). Somatic cell nuclear transfer (SCNT) experiments in Xenopus demonstrated that the oocyte has the capacity to reprogram a differentiated somatic nucleus into a cloned embryo (Gurdon et al., 1958). This epigenetic reprogramming capacity of the oocyte is also conserved in mammals (Campbell et al., 1996). It is thought that the epigenetic reprogramming capacity of the oocyte enables the MZT. Nevertheless, the enzymes involved in maternal epigenetic reprogramming, and the consequences of failure to reprogram, largely remain a mystery. Recently, work in C. elegans implicated LSD1/SPR-5/KDM1A (previously referred to as LSD1, hereafter referred to as KDM1A) in maternal reprogramming at fertilization. Di-methylation of lysine 4 on histone H3 (H3K4me2) is acquired in gamete genes during the specification and maintenance of the germline. The H3K4me2 demethylase KDM1A is maternally deposited into the zygote at fertilization and required to prevent H3K4me2 from being inherited transgenerationally. Without KDM1A, H3K4me2 accumulates at gamete genes across generations and results in the inappropriate expression of these genes. This correlates with increasing sterility in the population over time (Katz et al., 2009). The requirement to reprogram H3K4 methylation is also suggested to be a critical step in SCNT. During SCNT in Xenopus, the cloned embryos often inappropriately express genes from the tissue where the somatic nucleus was derived (Ng and Gurdon, 2005). This transcriptional memory can be eliminated by overexpressing histone H3 with a mutated K4 residue (Ng and Gurdon, 2008). This work implies that H3K4 methylation may be the carrier of transgenerational transcriptional memory, and that complete reprogramming may require the removal of this modification. Genomic imprinting is the monoallelic expression of a small number of genes based on their parent of origin (Bartolomei and Tilghman, 1997). Imprinted genes are dependent upon DNA methylation at small imprinting control regions (ICRs) associated with these loci (Bartolomei and Tilghman, 1997). At ICRs, CpG methylation is established in the gametes and maintained throughout the development of the offspring (Bartolomei, 2009). In mammals, there are two amine-oxidase histone demethylases, LSD2/KDM1B (hereafter referred to as KDM1B) and KDM1A (Ciccone et al., 2009; Shi et al., 2004). KDM1B is expressed mainly in the oocyte and required for the establishment of maternal imprints at imprinted loci (Ciccone et al., 2009; Stewart et al., 2015). Without KDM1B, embryos derived from these oocytes exhibit a maternal effect embryonic lethality phenotype prior to mid-gestation (Ciccone et al., 2009). This demonstrates that, similar to C. elegans, amine oxidase-type histone demethylases can function maternally in mammals. KDM1A is a component of several protein complexes. As part of the CoREST complex, it specifically demethylates H3K4me1/2, but not H3K4me3 (Shi et al., 2004; You et al., 2001). Alternatively, when associated with the Androgen Receptor complex KDM1A has been shown to demethylate H3K9me2 in vitro (Metzger et al., 2005). KDM1A is an essential gene in mammalian development, as homozygous mutants fail to develop properly after implantation and die prior to embryonic day 8 (e8) (Foster et al., 2010; Macfarlan et al., 2011; Wang et al., 2007). To determine whether KDM1A may also be involved in maternal reprogramming, we conditionally deleted Lsd1/Kdm1a (previously referred to as Lsd1, hereafter referred to as Kdm1a) in mouse oocytes with three different maternal Cre transgenes. Deletion of Kdm1a maternally with either Zp3-Cre or Gdf9-Cre results in embryonic lethality primarily at the 1-2C stage and these embryos fail to undergo the MZT. This suggests that KDM1A plays a conserved role in maternal reprogramming. Surprisingly, deletion of Kdm1a maternally with Vasa-Cre results in an incomplete loss of KDM1A in oocytes. This uncovers a hypomorphic effect in which some surviving animals exhibit long-range developmental defects, including perinatal lethality and behavioral abnormalities. These defects are associated with disruption of the epigenetic landscape, including aberrant DNA methylation and expression at imprinted loci. These results demonstrate that defects in epigenetic reprogramming between generations can lead to abnormalities later in development. Based on the previously demonstrated maternal role of KDM1A in C. elegans and KDM1B in mice, we first asked if KDM1A is expressed in mouse oocytes (Ciccone et al., 2009; Katz et al., 2009). RNA-seq datasets from ovulated oocytes and 2C-stage embryos suggested abundant KDM1A transcripts in these cells (Macfarlan et al., 2012). Immunofluorescence (IF) and immunohistochemistry (IHC) with an antibody raised against KDM1A confirms that KDM1A is expressed in the oocyte nucleus and in the surrounding follicle cells throughout oocyte development (Figure 1A, Figure 1—figure supplement 1A–L). Therefore, to determine if KDM1A functions in oocytes, we conditionally deleted Kdm1a by crossing Kdm1afl/fl mice (Wang et al., 2007) to three different maternal Cre transgenic lines, Ddx4/Vasa-Cre (Gallardo et al., 2007), Gdf9-Cre (Lan et al., 2004) and Zp3-Cre (de Vries et al., 2000) (oocytes and embryos from Kdm1afl/Δ::Ddx4/VasaCre, Kdm1afl/Δ::Gdf9-Cre, and Kdm1afl/Δ::Zp3-Cre mice will be referred to hereafter as Kdm1aVasa, Kdm1aGdf9 and Kdm1aZp3 respectively). Vasa-Cre is expressed in the germline beginning at e18 and induces full deletion by birth (Figure 1B) (Gallardo et al., 2007). Gdf9-Cre is expressed in oocytes beginning at postnatal day 3 (P3), including in primordial follicles (Lan et al., 2004), while Zp3-Cre is also expressed in oocytes, but beginning at P5 in primary follicles (Figure 1B) (de Vries et al., 2000). KDM1A IHC and IF demonstrate that deletion of Kdm1a with either Gdf9-Cre or Zp3-Cre results in the complete loss of KDM1A from the oocyte nucleus (Figure 1C–F,I). Crossing the Kdm1afl/fl allele to Vasa-Cre also results in complete maternal deletion, as can be determined by the 100% segregation of the maternally deleted allele to the offspring (all of offspring from Kdm1aVasa mothers crossed to wild-type fathers result in heterozygous -/+ offspring) (Figure 1—figure supplement 2). This demonstrates that, similar to deletion via Gdf9-Cre or Zp3-Cre, crossing the Kdm1afl/fl allele to Vasa-Cre also effectively deletes Kdm1a maternally. However, for reasons that are not clear, deletion of Kdm1a with Vasa-Cre results in a hypomorphic effect, where 33.3% of oocytes completely lack KDM1A protein, but 66.7% retain a low level of KDM1A (Figure 1G–I). This incomplete effect is surprising because the Vasa-Cre transgene is reported to be expressed earlier in the germline than either Gdf9-Cre or Zp3-Cre (Figure 1B) (Gallardo et al., 2007; Lan et al., 2004). It is possible that the low level of KDM1A remaining in some oocytes is due to delayed deletion of Kdm1a, though the reason for this potential delay is unknown. Maternal expression and coditional deletion of Kdm1a in mouse oocytes. (A) Wild-type mouse oocyte nucleus (white arrowhead) and surrounding follicle cells (white asterisks) stained with anti-KDM1A (green) antibody and DAPI (red). (B) Developmental timeline of maternal Cre expression (Vasa-Cre, Gdf9-Cre and Zp3-Cre transgenes) and corresponding oogenesis stages. (C,D) Immunohistochemistry (IHC) with anti-KDM1A (brown) antibody and hematoxylin (blue) showing KDM1A nuclear expression (black arrowhead) and absence of expression (white arrowheads) in Kdm1aGdf9 control (C) and mutant (D) oocytes. (E,F) Immunofluorescence (IF) with anti-KDM1A (green) antibody, phalloidin (red) and DAPI (blue) showing KDM1A nuclear expression (black arrowhead) and absence of expression (white arrowheads) in Kdm1aZp3 control (E) and mutant (F) oocytes. (G,H) IHC with anti-KDM1A (brown) antibody and hematoxylin (blue) showing KDM1A nuclear expression (black arrowhead), absence of expression (white arrowhead) and reduced expression (pink arrowhead) in Kdm1aVasa control (G) and mutant (H) oocytes. (I) Percentage of oocytes with KDM1A (green), reduced KDM1A (red) or no KDM1A blue) staining in Kdm1aGdf9 and Kdm1aVasa heterozygous control versus mutant oocytes. Scale bars represent 50 μm. n=number of oocytes analyzed with percentages indicated for each category. To determine if there is a functional requirement for maternal KDM1A in mice, we crossed Kdm1aVasa, Kdm1aGdf9 and Kdm1aZp3 females to wild-type males to generate heterozygous offspring (Figure 1—figure supplement 2). In mice, zygotic transcription begins in the 1C embryo just prior to the first cleavage to the 2C stage (Aoki et al., 1997; Hamatani et al., 2004; Xue et al., 2013). The heterozygous offspring from the maternally deleted mothers have a normal Kdm1a gene on the paternal allele. Thus, crossing maternally deleted mothers to wild-type fathers enables us to isolate the maternal function of KDM1A (Maternal-, Zygotic+, hereafter referred to as M-Z+). M-Z+ heterozygous embryos derived from Kdm1aGdf9 mutant mothers are hereafter referred to as Kdm1aGdf9 M-Z+ embryos, while M+Z+ heterozygous embryos derived from littermate control mothers that are Cre minus are hereafter referred to as Kdm1aGdf9 M+Z+ embryos. Kdm1aGdf9 M-Z+ embryos exhibit embryonic arrest at the 1-2C stage (Figure 2—figure supplement 1A–I). Specifically, in control Kdm1aGdf9 M+Z+ embryos at embryonic day 1.5 (e1.5), we observe 7% fragmented/degraded embryos, 65% 1-cell embryos and 28% 2-cell embryos (n=135, Figure 2—figure supplement 1I). In contrast, in Kdm1aGdf9 M-Z+ embryos at e1.5 we observe 40% fragmented/degraded embryos, 59% unfertilized oocytes or 1-cell embryos, and only 1% 2C embryos (n=134, Figure 2—figure supplement 1I). The vast majority of the non-degraded Kdm1aGdf9 M-Z+ embryos are clearly fertilized and arrested at the 1C stage. However, we do occasionally observe unfertilized oocytes. In addition, we sometimes observe embryos that are highly abnormal morphologically and are difficult to clearly assign to a particular category. As a result, we quantified these Kdm1aGdf9 M-Z+ embryos together. Nevertheless, compared to Kdm1aGdf9 M+Z+ embryos, Kdm1aGdf9 M-Z+ embryos have a large increase in the number of fragmented/degraded embryos at the expense of normal 2C embryos (Figure 2—figure supplement 1I). Also, the remaining 1C and 2C Kdm1aGdf9 M-Z+ embryos do not progress beyond the 1-2C stage, as we never observe any later stage embryos even at e2.5 (Figure 2—figure supplement 1C,G,H). M-Z+ heterozygous embryos derived from Kdm1aZp3 mothers (hereafter referred to as Kdm1aZp3 M-Z+embryos) undergo a phenotype that is similar to Kdm1aGdf9 M-Z+ embryos. At e1.5, 95% (n=20) of control Kdm1aZp3 M+Z+ embryos have reached the 2C stage (Figure 2E). In contrast, at e1.5 only 35% (n=57) of Kdm1aZp3 M-Z+ embryos reach the 2C stage (Figure 2E), though this is still much higher than the 1% of Kdm1aGdf9 M-Z+ embryos that reach the 2C stage (Figure 2—figure supplement 1I). It is not clear why there is a difference in the number of Kdm1aZp3 versus Kdm1aGdf9 M-Z+ embryos that cleave to the 2C stage. However, this may be due to subtle differences in developmental timing, strain background, or Cre specific differences. In addition, we have observed two Kdm1aZp3 M-Z+ embryos that develop past the 2C stage to the 3C- and 4C- stage (Figure 2—figure supplement 1J,K), though like the Kdm1aGdf9 M-Z+ embryos, no Kdm1aZp3 M-Z+ embryos survive to the blastocyst stage (data not shown). Taken together, the results from Kdm1aGdf9 and Kdm1aZp3 mice suggest that the embryonic arrest, primarily at the 1-2C stages is the KDM1A maternal loss-of-function phenotype. Kdm1aZp3 embryos arrest at the 1–2 cell stage. (A–D) Brightfield images of (A,C) M+Z+ and (B,D) M-Z+ 1- and 2-cell embryos derived from Kdm1aZp3 control and mutant mothers at e1.5. (E) Percentage of 1-cell (green) and 2-cell (yellow) embryos derived from Kdm1aZp3 control and mutant mothers at e1.5. n = 40 for Kdm1aZp3 M+Z+ embryos from 3 litters. n = 57 for Kdm1aZp3 M-Z+ embryos from 6 litters. To determine the maternal function of KDM1A, we considered two possibilities; (1) that KDM1A affects transcription in the oocyte, or (2) that maternal KDM1A affects transcription post-fertilization during the MZT. To determine if KDM1A affects transcription in the oocyte, we first compared the transcriptome of control Kdm1afl/fl (Macfarlan et al., 2012) versus Kdm1aZp3 mutant oocytes. We found relatively few transcriptional changes, with 195 genes over expressed and 281 genes under expressed in Kdm1aZp3 oocytes (Figure 3A, Figure 3—source data 1A, Figure 3—figure supplement 5). In addition, amongst the 875 repeat types extracted from the RepeatMasker database (including LINEs, SINEs, etc.) there were only 2 repeat families that were activated and 2 repressed in Kdm1aZp3 oocytes (Figure 3A, Figure 3—source data 1A, Figure 3—figure supplement 5). Manual inspection revealed that few of these genes/repeats had both large fold-changes and low p-values, with the exception of the Mt1 gene, which was very highly activated in Kdm1aZp3 oocytes. Furthermore, we found several mitochondrially encoded genes (like mtCo3 and Atpase6) that had small but significantly reduced levels in Kdm1aZp3 oocytes. These mitochondrial genes are unlikely to be directly regulated by KDM1A, but their reduced levels could indicate a subtle metabolic defect in the mutants. Taken together, these results demonstrate that loss of KDM1A has little effect on transcription in oocytes. The MZT is impaired in Kdm1aZp3 mutants. 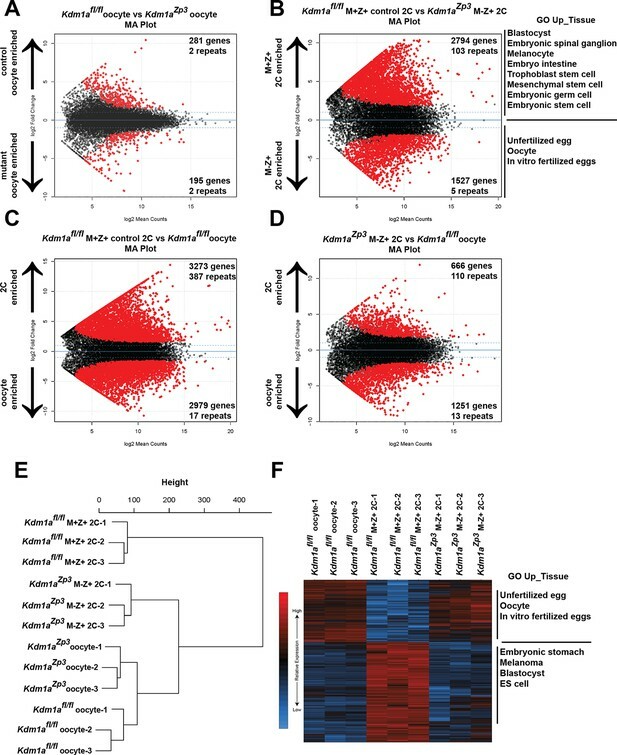 (A,B) Differential expression of mRNAs in Kdm1afl/fl versus Kdm1aZp3 oocytes (A) or Kdm1afl/fl M+Z+ versus Kdm1aZp3 M-Z+ 2C embryos (B) as determined by RNA-seq. Genes/repeats highlighted in red are significant with the number of significant gene/repeats show. GO enrichment using the Up_tissue database was performed on Kdm1afl/fl M+Z+ 2C enriched and Kdm1aZp3 M-Z+ 2C enriched mRNAs, with a list of the most enriched categories displayed. (C,D) Differential expression of mRNAs in Kdm1afl/fl M+Z+ 2C embryos versus Kdm1afl/fl oocytes (C) or Kdm1aZp3 M-Z+ 2C embryos versus Kdm1afl/fl oocytes (D). The numbers of zygotically activated (2C enriched) genes/repeats and zygotically repressed (oocyte enriched) genes/repeats are highlighted in each comparison. (E) Hierarchical cluster dendrogram of transcriptomes in Kdm1afl/fl oocytes, Kdm1aZp3 oocytes, Kdm1afl/fl M+Z+ 2C embryos, and Kdm1aZp3 M-Z+ 2C embryos. (F) Heat map of gene expression of principal component 1 (PC1) genes in Kdm1afl/fl oocytes, Kdm1afl/fl M+Z+ 2C embryos, and Kdm1aZp3 M-Z+ 2C embryos. The most GO Up_tissue enriched terms are displayed for the 2 categories of PC1 genes. Since we did not see a significant affect on oocytes, we considered the possibility that loss of KDM1A affects transcription post-fertilization during the MZT. To determine if this is the case, we isolated fertilized Kdm1aZp3 M-Z+ embryos that cleaved to the 2C stage, and compared them to Kdm1afl/fl M+Z+ 2C embryos (Macfarlan et al., 2012). We chose to focus on embryos from Kdm1aZp3 mothers because a substantially higher proportion of these embryos reach the 2C stage. We found a dramatic alteration of the transcriptome, with 1527 genes over expressed and 2794 genes under expressed in Kdm1aZp3 M-Z+ 2C embryos (Figure 3B, Figure 3—source data 1B). In addition, there were 103 repeat families that were repressed in Kdm1aZp3 2C M-Z+ embryos, compared with only 5 that were activated (Figure 3B, Figure 3—source data 1B). These findings are in contrast to what has been observed in Kdm1a mutant ES cells that display a general de-repression of both genes and repeats (Macfarlan et al., 2011; Macfarlan et al., 2012). GO analysis of over and under expressed genes in Kdm1aZp3 2C M-Z+ embryos demonstrated an enrichment of genes normally expressed in unfertilized oocytes, and a reduction in genes associated with embryonic development and tissue specific gene expression. This suggests that Kdm1aZp3 M-Z+ 2C embryos may fail to undergo the MZT (Figure 3B, Figure 3—source data 1B). To test this hypothesis further, we compared the expression of mRNAs from control Kdm1afl/fl M+Z+ 2C embryos (Macfarlan et al., 2012) or Kdm1aZp3 M-Z+ 2C embryos with Kdm1afl/fl oocytes (Macfarlan et al., 2012). If the Kdm1aZp3 M-Z+ 2C embryos fail to undergo the MZT, then we would expect them to be more similar to Kdm1afl/fl oocytes than Kdm1afl/fl M+Z+ 2C embryos. In Kdm1afl/fl M+Z+ 2C embryos relative to Kdm1afl/fl oocytes, there are massive changes in the mRNA profile, with >3,000 genes (and 387 repeat families) becoming zygotically activated and ~3000 maternal genes (and 17 repeat families) which are suppressed. This demonstrates that MZT has occurred (Figure 3C, Figure 3—source data 1C). In contrast, Kdm1aZp3 M-Z+ 2C embryos fail to properly activate the zygotic genome, with only 666 genes becoming activated (and 110 repeat families), and only ~1200 maternal genes repressed (13 repeat families) (Figure 3D, Figure 3—source data 1D). Hierarchical clustering of Kdm1afl/fl oocytes, Kdm1aZp3 oocytes, Kdm1afl/fl M+Z+ 2C embryos and Kdm1aZp3 M-Z+ 2C embryos confirms this failure to activate the zygotic genome. Specifically, though Kdm1afl/fl oocytes are similar to Kdm1aZp3 oocytes, Kdm1aZp3 M-Z+ 2C embryos are more similar to Kdm1afl/fl oocytes than Kdm1afl/fl M+Z+ 2C embryos (Figure 3E). In addition, principal component analysis (PCA) demonstrated that ~40% of the variance between Kdm1afl/fl oocytes, Kdm1afl/fl M+Z+ 2C embryos, and Kdm1aZp3 M-Z+ 2C embryos can be explained by a single component (PC1, Figure 3—figure supplement 2), and the heat maps generated from PC1 genes confirm that Kdm1aZp3 M-Z+ 2C embryos have expression profiles more similar to Kdm1afl/fl oocytes than Kdm1afl/fl M+Z+ 2C embryos (Figure 3F). GO analysis demonstrated that PC1 genes fall into two categories, those associated with unfertilized oocytes and are highly expressed in oocytes and Kdm1aZp3 M-Z+ 2C embryos, and those associated with early embryonic development which are enriched only in Kdm1afl/fl M+Z+ 2C embryos (Figure 3F). Taken together, these data confirm that the major defect in the transcriptome of Kdm1aZp3 M-Z+ 2C embryos is a failure to undergo the MZT. Deletion of Kdm1a with either Gdf9-Cre or Zp3-Cre results in 100% of oocytes completely lacking KDM1A (Figure 1C–F). In contrast, 66.7% of Kdm1aVasa mutant oocytes retain some KDM1A protein, though the amount is much lower than heterozygous control oocytes (Figure 1G–I). To determine if this lower amount of KDM1A retained in some Kdm1aVasa mutant oocytes gives rise to a hypomorphic phenotype, we mated Kdm1aVasa females to wild-type males to generate heterozygous M-Z+ offspring (Figure 1—figure supplement 2). As is the case with Kdm1aGdf9 and Kdm1aZp3 M-Z+ offspring, these heterozygous M-Z+ offspring (hereafter referred to as Kdm1aVasa M-Z+ embryos) have a normal paternal Kdm1a allele. Thus, any phenotypic effects in these Kdm1aVasa heterozygous M-Z+ offspring are due to reduced maternal KDM1A. Similar to Kdm1aGdf9 and Kdm1aZp3 M-Z+ embryos, the majority of Kdm1aVasa M-Z+ embryos arrest prior to the blastocyst stage (Figure 4A–E). In control Kdm1aVasa M+Z+ embryos at e3.5, 55% of embryos have reached the blastocyst stage, 35% are multicellular (>2C) and 10% are fragmented/degraded (n=37, Figure 4E). In contrast, at e3.5 85% of the Kdm1aVasa M-Z+ embryos have fragmented/degraded (n=35, Figure 4E). However, unlike Kdm1aGdf9 and Kdm1aZp3 M-Z+ embryos, which undergo complete embryonic arrest at the 1-2C stage, by e3.5 6% of Kdm1aVasa M-Z+ embryos have reached the multicellular stage (>2C) and 5% are blastocysts (n=35, Figure 4E). Remarkably, some of these Kdm1aVasa M-Z+ embryos survive to birth. The average litter size born from Kdm1aVasa mutant mothers is 2.3 (n=20), versus 6.2 (n=32) born from littermate control mothers (Figure 4F). However, the vast majority of time vaginal plugged Kdm1aVasa mutant mothers give rise to no viable progeny. Thus, this average litter size is undoubtedly a vast overestimate of the survival of Kdm1aVasa M-Z+ embryos overall. Hypomorphic phenotype in Kdm1aVasa progeny. (A–D) Brightfield images of M+Z+. (A) and M-Z+ (B–D) embryos derived from Kdm1aVasa control and mutant mothers at embryonic day 3.5 (e3.5). Panels show blastocysts (A,B), a multicellular embryo (C) and a fragmented embryo (D). (E) Percentage of fragmented (purple), 1-cell (green), multi-cellular (blue) and blastocyst (yellow) embryos from Kdm1aVasa control and mutant mothers at e3.5. n = 58 for Kdm1aVasa M+Z+ embryos from 7 litters. n = 79 for Kdm1aVasa M-Z+ embryos from 10 litters. (F) Litter sizes of Kdm1aVasa control and mutant mothers. Average litter size for each indicated by red line. Each circle indicates one litter and n=number of litters analyzed. p-values calculated using an unpaired t-test with **** = p<0.0001 indicating statistical significance. (G) Percentage of newborn pups from Kdm1aVasa heterozygous control and mutant mothers that died perinatally. n = number of litters analyzed. p-values calculated using an unpaired t-test with **** = p<0.0001 indicating statistical significance. The transition from in utero development to postnatal development, during the first 48 hr immediately following birth, is a highly stressful time for mice. If a mouse has a subtle defect during embryogenesis, the newborn pup may die perinatally. This is reflected in the large number of mouse models that exhibit perinatal lethality (Turgeon and Meloche, 2009). Therefore, to determine if lower maternal KDM1A might give rise to more subtle embryonic defects, we carefully monitored the first 48 hr following birth in Kdm1aVasa M-Z+ progeny. Consistent with this being a major developmental transition, even in genotypically normal mice, we observe that 5% of offspring (n=216) born from littermate Kdm1aVasa control mothers die perinatally during the first 48 hr after birth (Figure 4G). However, in Kdm1aVasa M-Z+ progeny, the percentage of perinatal lethality is significantly increased (26%, n=47) (Figure 4G). It is unclear why these animals are dying perinatally. However, this increase in perinatal lethality is consistent with these animals having more subtle developmental defects. Of the small number of M-Z+ animals that are born from Kdm1aVasa mutant mothers, nearly 1/3 die perinatally in the first 48 hr after birth. However, the remaining 2/3 survive to adulthood and appear to be morphologically normal. Notably, because of the embryonic arrest and the perinatal lethality, this remaining 2/3 is a very small number of animals (n=10 from 8 crosses). Since progeny from Kdm1aVasa mutant mothers have defects that can lead to perinatal lethality, we considered the possibility that the surviving animals from these Kdm1aVasa mutant mothers (hereafter referred to as Kdm1aVasa M-Z+ adults) could have phenotypic defects as well. To analyze these surviving animals, we crossed Kdm1aVasa mutant mothers (C57BL/6 background) to M. castaneus (CAST) fathers. This enabled us to use polymorphisms to examine subsequent molecular defects in a parent of origin specific fashion. Importantly, F1 hybrid (B6/CAST) offspring from Kdm1aVasa mutant mothers have the same hypomorphic phenotype that we observe in a B6 background, where a small number of animals survive until birth (average litter size=1.6, n=6 litters from 8 crosses). Mating the surviving Kdm1aVasa M-Z+ adults produced progeny, suggesting no gross defects in the specification of the germline or mating behavior. However, when we observed these Kdm1aVasa M-Z+ adults closely, we noticed that they exhibit abnormal behaviors (Figure 5—figure supplement 1A, Video 1). These abnormal behaviors include excessive scratching and digging, along with food harassing, where animals grind up all of the remaining food in the food hopper and incorporate it into the bedding (Figure 5A–C). To quantify the food harassing behavior, we monitored both the weight of the food in the food hopper and the height of the bedding in the cage. Over a 3-day period, each individual Kdm1aVasa M-Z+ adult almost completely depleted the food in the food hopper due to food grinding and harassing (Figure 5D and Figure 5—figure supplement 1B–D). This resulted in a correspondingly large increase in the height of the bedding over a 6-day period (Figure 5E). These effects are not observed in Kdm1aVasa mutant mothers or the M. castaneus animals to which they were mated (Figure 5D,E and Figure 5—figure supplement 1B,E), indicating that the behavior may be due to a maternal effect. To determine if this behavior is due to a maternal effect, we intercrossed the affected Kdm1aVasa M-Z+ adults. If the food-grinding behavior is due to a maternal effect, then mating two affected Kdm1aVasa M-Z+ adults should not produce progeny with abnormal behavior. This is because the Kdm1aVasa M-Z+ adults used as mothers in these crosses have a normal Kdm1a allele (-/+) so the resulting intercrossed progeny (hereafter referred to as F2 intercrossed M+Z+ adults) are all M+. Intercrossing affected M-Z+ F1 hybrids produced no F2 intercrossed M+Z+ adults with the food-grinding behavior, suggesting that the food-grinding behavior is dependent upon a maternal effect (Figure 5D,E and Figure 5—figure supplement 1D,G). Nevertheless, it remains possible that the F1 hybrid background also contributes to the abnormal behavior. To test this possibility, we crossed control littermates of Kdm1aVasa mothers to CAST fathers to generate control B6/CAST hybrids (hereafter referred to as B6/CAST M+Z+ controls). These control hybrids exhibit modest food-grinding behavior, suggesting that the hybrid strain background likely also contributes to the maternal food-grinding defect (Figure 5D,E and Figure 5—figure supplement 1C,F). However, Kdm1aVasa M-Z+ adults are significantly more affected than B6/CAST M+Z+ hybrid controls (Figure 5D,E and Figure 5—figure supplement 1C,F), suggesting that the abnormal food-grinding behavior is predominantly due to a maternal effect. Importantly, we also do not observe any Kdm1a haploinsufficiency defects. For example, the F2 intercrossed M+Z+ adults that are heterozygous for Kdm1a do not exhibit this abnormal behavior (Figure 5D,E; Figure 5—figure supplement 1D,G). This suggests that the abnormal behavior is not due to Kdm1a haploinsufficiency. Finally, behavioral defects were observed in Kdm1aVasa M-Z+ survivors obtained from litters ranging from one to four animals. This suggests that the maternal behavioral abnormalities are not simply due to reduced litter size. Stereotypical and abnormal behaviors in Kdm1aVasa M-Z+ adults. 0:00-0:27 M. castaneus (CAST) control playing behavior. 0:27-0:40 M. castaneus (CAST) control eating. 0:40-1:03 (right) Kdm1aVasa M-Z+ adult food harassing behavior. 1:03-1:28 (right) Kdm1aVasa M-Z+ adult abnormal scratching behavior. 1:28-1:45 (right) Kdm1aVasa M-Z+ adult food harassing behavior and (left) abnormal digging behavior. Abnormal behaviors in Kdm1aVasa M-Z+ adults. (A–C) Mouse cages at day 0 (A) and day 8 (B) from M. castaneus (CAST) controls compared to day 6 (C) from a Kdm1aVasa M-Z+ adult. (D) Quantification of change in weight of food in the hopper from CAST controls, B6/CAST hybrid M+Z+ controls, and F2 intercrossed M+Z+ adults versus Kdm1aVasa M-Z+ adults. Data are shown as mean for each day with error bars indicating ± S.E.M. (E) Quantification of change in bedding height from CAST controls, B6/CAST hybrid M+Z+ controls, and F2 intercrossed M+Z+ adults versus Kdm1aVasa M-Z+ adults. Data are shown as mean for each day with error bars indicating ± S.E.M. 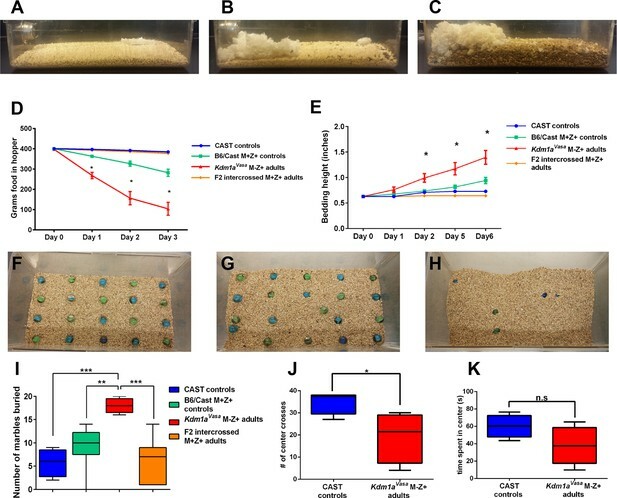 (F–H) Mouse cages before (F) and after (G,H) the marble burying assay was performed on a CAST control (G) compared to a Kdm1aVasa M-Z+ adult (H). (I) Quantification of the number of marbles buried during the marble burying assay performed on CAST controls, B6/CAST hybrid M+Z+ controls, and F2 intercrossed M+Z+ adults versus Kdm1aVasa M-Z+ adults. Data are shown as quartiles with error bars indicating ± S.E.M. (J,K) Open field test performance in CAST controls versus Kdm1aVasa M-Z+ adults scored by number of center crosses (J) and time spent in center of cage (K). Data are shown as quartiles with error bars indicating ± S.E.M. p-values calculated using an unpaired t-test with n.s. indicating p>0.05, * = p<0.05, ** = p<0.005, *** = p<0.0005. All asterisks indicate statistical significance. Observations of Kdm1aVasa M-Z+ adults indicated that these mice also exhibit excessive digging (Figure 5—figure supplement 1A, Video 1). To quantify this behavior, we assayed Kdm1aVasa M-Z+ adults and controls in a marble-burying assay. In this assay, individual mice are placed in a cage in which 20 marbles are arrayed on top of the bedding. Mice exhibiting excessive digging behavior will bury higher numbers of marbles. For example, Slitrk5 obsessive-compulsive mice bury approximately 50% of the marbles in 30 min, compared to approximately 25% in controls (Shmelkov et al., 2010). Kdm1aVasa M-Z+ adults exhibit striking behavior in the marble-burying assay. Compared to M. castaneus controls, which bury 25% in 25 min (Figure 5G,I, Video 2), Kdm1aVasa M-Z+ adults bury 90% in the same time period (Figure 5H,I, Video 2). Similar to what was observed in the food-grinding assays, we do not observe this behavior in F2 intercrossed M+Z+ adults (average 7 marbles, Figure 5I), but we do see slightly elevated marble-burying in B6/CAST hybrid controls (average 10, Figure 5I). 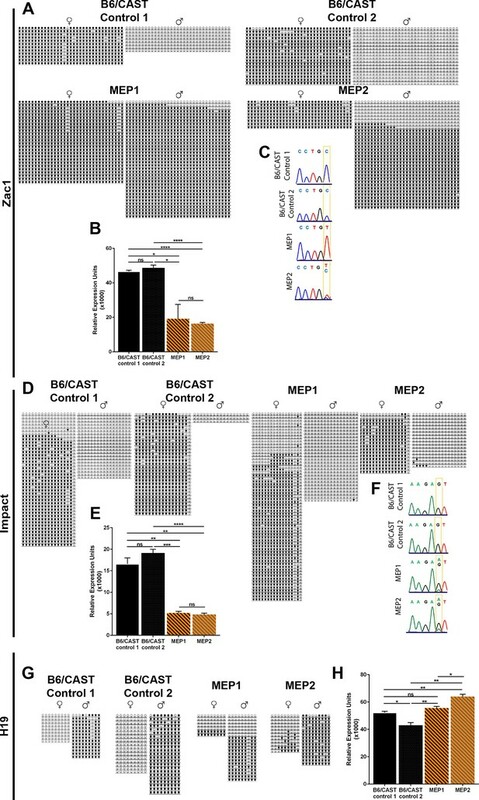 Nevertheless, as in the food-grinding assay, Kdm1aVasa M-Z+ adults are significantly more affected than B6/CAST hybrid M+Z+ controls (Figure 5D,E and Figure 5—figure supplement 1C,F). Taken together, these data indicate that the excessive digging behavior is also predominantly due to a maternal effect. Finally, we also performed the open-field test on Kdm1aVasa M-Z+ adults. In this assay, animals are placed in a much larger space than they are accustomed to. Animals that are more anxious or fearful cross the middle of cage fewer times and spend less time overall in the center (Video 3). Consistent with the behavioral defects that we observe in food-grinding and marble-burying, Kdm1aVasa M-Z+ adults perform significantly fewer movements across the middle of the cage (Figure 5J) and spend less time in the center overall than CAST controls (Figure 5K). Marble burying in Kdm1aVasa adults. 0:00-0:23 Clip 1 of M. castaneus (CAST) control in marble burying assay. 0:23-0:44 Clip 2 of M. castaneus (CAST) control in marble burying assay. 0:44-1:22 Clip 1 of Kdm1aVasa M-Z+ adult in marble burying assay. 1:22-1:36 Clip 2 of Kdm1aVasa M-Z+ adult in marble burying assay. 1:36-2:13 Clip 3 of Kdm1aVasa M-Z+ adult in marble burying assay. Open field test on Kdm1aVasa M-Z+ adults. 0:00-0:30 M. castaneus control in open field test. 0:30-0:56 Kdm1aVasa M-Z+ adult in open field test. The perinatal lethality and behavioral defects observed in Kdm1aVasa M-Z+ progeny are remarkable because these animals have a normal Kdm1a allele. Thus the defects that we observe in Kdm1aVasa M-Z+ progeny must be due to a heritable effect originating from the low level of maternal KDM1A. As a result, we sought to determine the nature of this heritable defect. The Kdm1a homolog Kdm1b is expressed maternally in mice, and loss of Kdm1b results in a heritable embryonic lethality defect associated with a failure to maternally acquire DNA methylation at imprinted genes (Ciccone et al., 2009; Stewart et al., 2015). Therefore, we considered the possibility that the heritable defects could be due to DNA methylation defects at these loci, or in maternally methylated imprinted loci unaffected by the loss of KDM1B. In addition, in our RNA-seq data, we observe the misregulation of multiple genes that could potentially affect DNA methylation at imprinted loci. For example, four genes that are known to maternally affect DNA methylation at imprinted loci, Tet1, Trim28, Zfp57 and Dppa3/Stella (Dawlaty et al., 2013; Li et al., 2008; Messerschmidt et al., 2012; Nakamura et al., 2007; Yamaguchi et al., 2013), are all misregulated in Kdm1aZp3 M-Z+mutants (Tet1: -3.8 fold, Trim28: -3.3 fold, Zfp57: +3.2 fold and Dppa3/Stella: +.58 fold, Figure 3—figure supplement 3; Figure 3—source data 1B, quantitative RT-PCR validation of Trim28, Zfp57 and Dppa3/Stella in Figure 3—figure supplement 4). Additionally, the DNA methyltransferase DNMT1 is overexpressed in Kdm1aZp3 M-Z+ mutants (Dnmt1: +2.1 fold, Figure 3—figure supplement 3; Figure 3—source data 1B). DNMT1 is thought to primarily act as the maintenance DNA methyltransferase (Li et al., 1992; Pradhan et al., 1999), but when overexpressed, DNMT1 has been shown to have de novo DNA methyltransferase activity (Vertino et al., 1996). Taken together, these observations raise the possibility that DNA methylation and monoallelic expression at imprinted genes could be altered in Kdm1aVasa M-Z+ progeny, either directly or indirectly. Interestingly, despite the clear loss of KDM1A in Kdm1aZp3 mutant oocytes, the regulatory proteins that are affected by the loss of KDM1A are either not expressed in oocytes (Tet1) or not affected until after fertilization (Trim28, Zfp57, Dppa3/Stella and Dnmt1, Figure 3—figure supplements 4,5). This is consistent with our previous observations that KDM1A primarily affects the MZT. To investigate DNA methylation and the expression of imprinted genes in Kdm1aVasa M-Z+ offspring, we performed bisulfite analysis and qRT-PCR on perinatal lethal Kdm1aVasa M-Z+ pups. We analyzed imprinted that are both maternally (Zac1, Impact, Igf2r, Mest, Snrpn) and paternally methylated (H19). For these analyses, we took advantage of B6/CAST polymorphisms to determine whether individual alleles in F1 hybrid offspring came from the mother or the father. These F1 hybrid pups, derived from hypomorphic B6 Kdm1aVasa mothers mated to wild-type CAST fathers, are denoted as maternal effect progeny 1 and 2 (MEP1 and MEP2), and were compared to two stage matched B6/CAST hybrid controls. Two imprinted loci, Zac1 and Impact, are severely affected in Kdm1aVasa offspring. At Zac1, DNA methylation is inappropriately acquired on the paternal allele in both MEP, though to a slightly lesser extent in MEP2 (Figure 6A). This is associated with significantly less expression of Zac1 in both MEP (Figure 6B). Moreover, Zac1 is normally expressed exclusively from the paternal allele (Figure 6C). However, in MEP1 Zac1 is now expressed exclusively from the maternal allele, while in MEP2, the slightly lower level of inappropriate paternal methylation is associated with biallelic expression (Figure 6C). At Impact, the overall DNA methylation pattern is unchanged (Figure 6D), but there is a dramatic change in expression. Impact is normally expressed exclusively from the paternal allele, but in both MEP1 and 2, Impact is now expressed predominantly from the maternal allele (Figure 6F). In addition, in both MEP1 and MEP2, there is a significant decrease in the overall expression level of Impact (Figure 6E). Imprinting defects in Kdm1aVasa progeny. (A,D,G) Allele-specific bisulfite analysis of Zac1 (A), Impact (D), and H19 (G). Each line represents the clone of an allele. Each circle represents a CpG dinucleotide where closed circles indicate methylation and open circles indicate no methylation. Maternal and paternal alleles are indicated. (B,E,H) Relative expression analysis of Zac1 (B), Impact (E), and H19 (H). Expression normalized to β-actin. Error bars indicate S.E.M. p-values calculated using an unpaired t-test with n.s. indicating p>0.05, * = p<0.05, ** = p<0.005, **** = p<0.0001. All asterisks indicate statistical significance. (C,F) Allele-specific expression of Zac1 (C) and Impact (F). The polymorphic base is highlighted in yellow. For Zac1, the maternal allele SNP is T (red) in highlighted position and paternal allele SNP is C (blue) in electrophoretogram. For Impact, the maternal allele SNP is A (green) in highlighted position and paternal allele SNP is G (black) in electrophoretogram. All analyses were performed on 2 staged matched B6/CAST hybrid control pups and 2 maternal effect progeny (MEP) exhibiting perinatal lethality. In addition to the altered imprinting at Zac1 and Impact, we observe a general disruption of several additional imprinted genes. At two of these additional imprinted loci (H19 and Igf2r), DNA methylation is altered (Figure 6G and Figure 6—figure supplement 1A). For example, at H19 DNA methylation is inappropriately lost on the paternal allele in MEP1 (Figure 6G). There is also a slight acquisition of inappropriate methylation on the maternal allele of both MEP (Figure 6G). At two additional imprinted genes (Mest and Snrpn), DNA methylation appears normal (Figure 6—figure supplement 1C,E). Furthermore, at three of the additional imprinted loci, we observe an overall decrease in gene expression. These include Igf2r, Mest, and Snrpn (Figure 6—figure supplement 1B,D,F), while at H19, expression levels are unaffected (Figure 6H). However, the allele-specific expression of all of these additional imprinted loci remains unaffected (data not shown). Taken together, the changes in DNA methylation and expression indicate a general disruption in the normal regulation of genomic imprinting. A major question in the field of epigenetics is whether histone methylation is regulated between generations, and whether potential defects in this process can lead to abnormalities in the resulting progeny. To address this question, we asked if the maternal reprogramming function of KDM1A, first demonstrated in C. elegans (Katz et al., 2009), is conserved in mammals. As in C. elegans, KDM1A is heavily deposited maternally in the mouse oocyte, suggesting that KDM1A could play a conserved role in maternal reprogramming (Figure 1). To address this hypothesis directly, we conditionally deleted Kdm1a maternally in mouse oocytes using three separate Cre drivers. Deletion of Kdm1a in developing oocytes via Gdf9-Cre or Zp3-Cre completely eliminates maternal KDM1A and results in embryonic arrest prior to the blastocyst stage, with the vast majority of embryos never developing past the 2C stage (Figures 1,2). This result is also observed when a second conditional Kdm1a allele (Zhu et al., 2014) is deleted with Zp3-Cre in the accompanying paper by Ancelin et al.. Thus, maternal KDM1A is essential for the progression of mammalian embryogenesis. 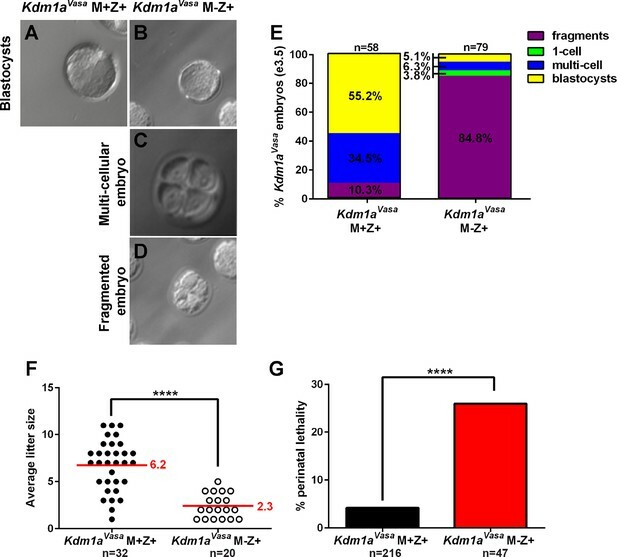 The observed 1-2C embryonic arrest does not rule out an additional role for KDM1A in oocyte maturation, as we observe that a small fraction of KDM1A deficient oocytes are unfertilized, fertilized with multiple sperm, or display other gross morphological defects, including loss of the zona pellucida. These occasional defects are also observed in the accompanying paper by Ancelin et al. Consistent with this, Kim et al. have recently reported that deletion of a different conditional Kdm1a allele with Zp3-Cre results in defects in meiotic progression (Kim et al., 2015). However, in contrast to our results, Kim et al. find that most oocytes are affected and are not fertilized (Kim et al., 2015). It is not entirely clear why the phenotypes are slightly different, but it could reflect subtle differences in the timing of deletion due to the use of different floxed alleles, or differences in strain background. Nevertheless, in Kdm1aGdf9 and Kdm1aZp3 mutants, we find that the majority of oocytes are fertilized normally, and many embryos undergo cleavage to reach the 2C stage (Figure 2). Also, in hypomorphic Kdm1aVasa animals we observe defects on the paternal allele of imprinted loci (Figure 6). These results suggest a requirement for KDM1A post-fertilization in the zygote. In mammals, zygotic transcription initiates between the one and two cell stage (Aoki et al., 1997; Hamatani et al., 2004; Xue et al., 2013). As a result, the heterozygous offspring derived from our crosses likely begin to express KDM1A from paternal allele at the 2C stage. Taken together, these results pinpoint a requirement for maternal KDM1A reprogramming between fertilization and cleavage. Consistent with this conclusion, the accompanying paper by Ancelin et al. demonstrates that chemically inhibiting KDM1A function post-fertilization also results in a 2C arrest. 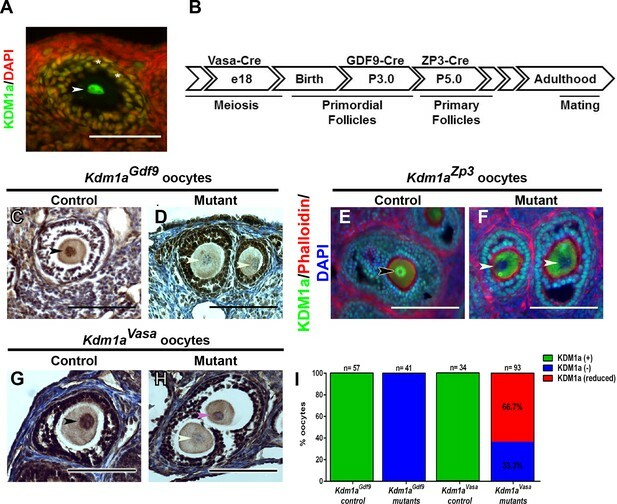 This further suggests a zygotic requirement for KDM1A immediately post-fertilization. When Kdm1a is deleted with Gdf9-Cre, only one embryo reached the 2C stage. In contrast, when Kdm1a is deleted with Zp3-Cre, many embryos cleave to the 2C stage and we even observe rare embryos that reach the 3C and 4C stage (Figure 2). This slight difference in phenotype is likely due to the fact that the Gdf9-Cre acts earlier than the Zp3-Cre. Nevertheless, the difference in phenotype suggests that KDM1A may act maternally at multiple discrete steps. This conclusion is reinforced by the recent demonstration that loss of KDM1A also impairs meiotic progression (Kim et al., 2015). Importantly, the observation that many maternally deleted embryos undergo cleavage, suggests that KDM1A is not just required for cell-cycle progression or cell viability (Figure 2). This conclusion is consistent with the observation that KDM1A null embryos survive until e8 (Wang et al., 2007). Furthermore, the difference in phenotype between maternally deleted embryos and embryonically deleted embryos, which survive to e8, clearly delineates the maternal requirement for KDM1A from the embryonic requirement. To determine the potential cause of the KDM1A maternal embryonic arrest, we profiled the expression of Kdm1afl/fl oocytes and Kdm1aZp3 M-Z+ embryos that underwent cleavage to the 2C stage. Compared to control 2C embryos that have robustly activated the zygotic transcriptional program, Kdm1aZp3 M-Z+ 2C embryos retain the expression of nearly 2 out of 3 oocyte genes, and fail to activate approximately 4 out of 5 zygotically activated embryonic genes (Figure 3). This indicates that maternally deleted Kdm1a embryos fail to undergo the MZT. Consistent with this being the primary defect in Kdm1aZp3 mutants, we observe relatively few transcriptional changes in Kdm1afl/fl oocytes (Figure 3). The requirement for KDM1A in facilitating the MZT is also demonstrated in the accompanying paper by Ancelin et al., where it is shown that maternal KDM1A is necessary for the multiple waves of zygotic gene activation. Thus, we propose that KDM1A plays a major role in facilitating the progression of embryogenesis by enabling the MZT. Surprisingly, in Kdm1aVasa oocytes, we found an incomplete loss of KDM1A protein, despite the fact that 100% of the progeny inherited the deleted Kdm1a allele (Figure 1). We have previously observed that strain background differences and/or specific interactions between Cre drivers and certain floxed alleles can lead to different patterns of deletion, often not matching published patterns. Thus, it is possible that Kdm1aVasa oocytes have a small amount of KDM1A remaining because the Vasa-Cre transgene occasionally works much later than previously reported when crossed with the Kdm1a floxed allele. Similar to Kdm1aZp3 and Kdm1aGdf9 M-Z+ embryos, many of the hypomorphic Kdm1aVasa M-Z+ embryos undergo early embryonic arrest (Figure 4). However, the partial loss of KDM1A maternal reprogramming also uncovers a hypomorphic phenotype where a few embryos survive past the 2C stage until birth (Figures 4–6). Of these animals that are born, a significantly increased fraction die perinatally (Figure 4). Furthermore, on the rare occasions that more than one animal was born from Kdm1aVasa mutant mothers, the full litter either all died perinatally or all survived. Remarkably, the perinatal lethal pups are derived from crosses between Kdm1aVasa mothers and wild-type fathers (M-Z+). This suggests that the increased perinatal lethality is due to hypomorphic maternal KDM1A in the mother’s oocyte. It remains possible that the small Kdm1aVasa M-Z+ litter sizes also contribute to the perinatal lethality, due to maternal neglect. However, many Kdm1aVasa M-Z+ animals that are born in small litters survive to adulthood (Table 1). This suggests that the perinatal lethality is not simply due to small litter size. Litter sizes for Kdm1aVasa animals Kdm1aVasa litters for mutant and control mothers indicating number of pups that died and entire litters that died. Kdm1aVasa adult, B6/Cast control, and F2 intercrossed control litter sizes that were assayed for behavioral defects. ( ) indicates pups that died. * indicates entire litter died. It is possible that subtle defects in maternal KDM1A reprogramming could also lead to behavioral abnormalities in the surviving adults. To investigate this possibility, we performed a number of behavioral assays on surviving Kdm1aVasa M-Z+ adult animals. These include monitoring food disappearance and bedding height to measure excessive food grinding, the marble burying assay to measure excessive digging behavior, and the open-field test, to measure anxiety. In all of these assays, we observe a maternal effect on behavior due to hypomorphic maternal KDM1A from Kdm1aVasa mothers (Figure 5). This suggests that hypomorphic KDM1A in the mother’s oocyte can lead to altered behavior in the resulting adult progeny. To investigate the potential molecular nature of the heritable defects, we analyzed DNA methylation and expression at imprinted loci. Both DNA methylation and expression are altered at imprinted genes in perinatal lethal Kdm1aVasa pups. In particular, we observe a striking disruption in the allele-specific expression of both Zac1 and Impact, along with decreased expression and altered DNA methylation at other imprinted loci (Figure 6). This suggests that subtle defects in maternal KDM1A can alter the epigenetic landscape in a heritable fashion. Also, though KDM1A and KDM1B may have some functional overlap, the distinct imprinting defects observed in each mutant demonstrate that they have functions that are not redundant (Ciccone et al., 2009; Stewart et al., 2015). Interestingly, both Zac1 and Impact have been associated with nervous system defects, and loss of Zac1 paternally results in perinatal lethality (Chung et al., 2011; Kosaki et al., 2001; Pereira et al., 2005; Roffe et al., 2013; Schmidt-Edelkraut et al., 2014; Varrault et al., 2006). Thus, it is tempting to speculate that defects in these genes could potentially contribute to the abnormalities that we observe in Kdm1aVasa M-Z+ progeny. Nevertheless, it remains unclear if this is the case. Loss of maternal KDM1A could lead to the observed phenomena (imprinting defects, perinatal lethality and behavioral abnormalities) either directly or indirectly. Evidence for an indirect mechanism can be inferred from the misregulation of several genes (Dnmt1, Tet1, Trim28, Zfp57, Uhrf1 and Dppa/Stella) that are known to regulate epigenetic information. For example, Tet1/Tet2 double mutants exhibit a partial perinatal lethality phenotype that is reminiscent of what we observe in Kdm1aVasa progeny (Dawlaty et al., 2013). Also, mice that are haploinsufficient for Trim28 display abnormal exploratory behaviors (Whitelaw et al., 2010). Alternatively, KDM1A may affect these phenomena by directly regulating histone methylation. For example, the removal of H3K4 methylation may be required to enable the activity of the DNMT3a/3b de novo methyltransferase complex (Ooi et al., 2007). Such a model has been proposed to account for the imprinting defects that are observed when KDM1B is maternally deleted (Ciccone et al., 2009; Stewart et al., 2015). Consistent with this model, the accompanying paper by Ancelin et al. demonstrates that loss of KDM1A maternally leads to global changes in both H3K4 and H3K9 methylation following fertilization. However, Stewart et al. recently demonstrated that loss of maternal KDM1A in mice does not affect H3K4me2, or the acquisition of DNA methylation at imprinted genes (Stewart et al., 2015). Moreover, the variable disruption of imprinting that we observe in hypomorphic animals is more consistent with a general disruption of epigenetic information. Thus, we favor a model in which the general disruption of epigenetic reprogramming, along with secondary epigenetic defects due to the misregulation of epigenetic reprogramming enzymes during the MZT, combine to give rise to the phenomena that manifest postnatally in progeny. Currently, we are engineering a hypomorphic maternal Kdm1a allele that can be used to generate larger numbers of hypomorphic animals to further elucidate these mechanisms. In summary, our data highlights three important consequences of the loss of maternal KDM1A: (1) early embryonic arrest and the failure of embryos to undergo the MZT, (2) perinatal lethality and altered behavior in rare surviving progeny from hypomorphic mothers, and (3) a general disruption of genomic imprinting in the hypomorphic progeny (Figure 7). Although these individual phenotypes may be linked, it is possible that they are separate outcomes that depend on distinct activities of maternal KDM1A during the MZT. Nevertheless, our results establish a novel mammalian paradigm in which altered epigenetic reprogramming by a histone demethylase between generations leads to defects that manifest weeks later, highlighting the potential long-range consequences of epigenetic perturbations in the early mammalian embryo. Loss of maternal LSD1 results in defects later in development in wild-type oocytes, after fertilization (denoted by blue sperm encircling oocyte) the fertilized egg undergoes the maternal to zygotic transition (MZT; green to blue/purple) at the 1–2 cell stage. These M+Z+ embryos proceed normally through development (indicated by blastocyst, perinatal stage pup, and adult mouse). In contrast, when Lsd1 is deleted with either Gdf9- or Zp3-Cre, the resulting Lsd1Gdf9 and Lsd1Zp3 progeny become arrest at the 1–2 cell stage and never undergo the MZT (green). When Lsd1 is deleted with Vasa-Cre, we observe 3 hypomorphic outcomes in resulting Lsd1Vasa progeny: (1) developmental arrest at the 1–2 cell stage, (2) perinatal lethality and (3) abnormal behavior in surviving adult animals. These outcomes are due to reduced LSD1 in the mothers oocyte, suggesting that lowered maternal LSD1 can result in defects much later in development. These long-range outcomes are associated with imprinting defects (depicted as wild-type versus mutant changes in DNA methylation within the yellow region). The following mouse strains were used: Kdm1a/Lsd1fl/fl MGI: 3711205 (Wang et al., 2007), Gdf9-Cre MGI: 3056522 (Lan et al., 2004), Ddx4/Vasa-Cre MGI: 3757577 (Gallardo et al., 2007), and Zp3-Cre MGI: 2176187 (de Vries et al., 2000) animals. To generate Kdm1a oocyte conditional knockout mice, Kdm1a/Lsd1fl/fl females were crossed to transgenic Cre males to generate Kdm1a/Lsd1Δ/+ F1 animals with Cre. F1 males were crossed to transgenic Cre females to generate Kdm1a/Lsd1Δ/+ F2 animals with Cre and F2 males were mated to Kdm1a/Lsd1fl/fl females to generate Kdm1a/Lsd1Δ/+ F2 animals with Cre. These maternally deleted Kdm1a/Lsd1Δ/Δ females were then mated to wild-type B6 or M. castaneus males to produce maternal effect progeny. Prior to the initial crosses, Kdm1a/Lsd1fl/fl were mated to C57BL/6 mice for several generations so that the genetic background is mostly B6. For Gdf9-Cre and Zp3-Cre, Kdm1a/Lsd1Δ/+ F1 animals with Cre were mated directly with Kdm1a/Lsd1fl/fl females. A table is included with the litter sizes of all perinatal lethal animals and all animals assayed in the behavioral assays (See Table 1). All mouse work was performed under the approved guidelines of the Emory University, NIH and Salk Institute IACUC. Polymorphisms were identified through the UCSC Genome Browser and subsequently verified through sequencing of parental strains and hybrid progeny (See Table 2). Allele-specific primers and polymorphisms, each primer and polymorphism used for allele-specific analysis bisulfite analysis and allele-specific expression analysis. To establish phenotypes in KDM1A maternal mutants, timed matings were set up between control/mutant females and wild-type males. Superovulation was found to have little affect on phenotypes, so we used superovulation to collect enough embryos for RNA-seq. For super-ovulation, PMSG was injected into sexually mature females on day 1. After 48 hr, females were injected with HcG and subsequently housed with stud males. Confirmation of natural or superovulatory matings on subsequent days was made via observation of a copulation plug. 1–2 cell embryos were flushed from ovarian tract at embryonic day 1.5 (e1.5), morulae on e2.5 and blastocysts on e3.5. Flushed embryos were categorized and imaged. Isolated mouse ovaries were fixed for 1 hr in 4% PFA on ice then washed with PBS multiple times over a 2 hr period. Ovaries were allowed to sit in 30% sucrose solution at 4°C overnight and were then embedded in OCT compound. 10 micron cryosections were obtained for analysis. Immunostaining was performed using rabbit polyclonal anti-KDM1A (1:200, Abcam, Cambridge UK, ab17721) and Alexa fluor conjugated secondary antibodies. Isolated mouse ovaries were fixed overnight in 4% PFA. Ovaries were then dehydrated in the following series of steps: 70% ethanol for 20 min 3 times; 85% ethanol for 45 min 2 times; 95% ethanol for 1 hr; 100% for 1 hr; xylenes overnight; xylenes:paraffin mix for 2 hr twice under vacuum; paraffin for 4 hr under vacuum; and paraffin under vacuum overnight. Oocytes were embedded in paraffin and 10 micron sections were taken for analysis. Immunostaining was performed using rabbit polyclonal anti-KDM1A (1:500, Abcam, ab17721). Oocytes were scored for presence of KDM1A signal with qualitative comparison to wild-type oocyte signal. DNA was isolated from sagittal sections of each perinatal pup. Bisulfite conversion was performed according to the Zymo (Irvine, CA) EZ DNA Methylation Kit protocol. Primer sets and polymorphisms used are listed in Table 1. The BiQ Analyzer program was used in the analysis of bisulfite converted sequences (Bock et al., 2005). RNA was isolated from sagittal sections of each perinatal pup using Trizol. SuperScript® III first-strand synthesis system was used to generate cDNA. The following cycling conditions were used: 95°C for 3 min, 95°C for 15 sec, 60°C for 30 sec, 72°C for 30 sec, 50 cycles. RNA-seq on KDM1A mutant and wild-type 2C embryos was performed as described (Macfarlan et al., 2012). Briefly embryos were lysed in Prelude Direct Lysis buffer (Nugen, San Carlos, CA) and amplified cDNAs were prepared using the Ovation RNA-seq system V2 (Nugen, 7102-32). Paired end libraries were prepared according to the Tru-seq library construction protocol starting with Covaris fragmentation step. Libraries were then sequenced on an Illumina Hi-seq 2000. For expression analysis, only first mate pair was used and reads were trimmed from 3' end to 50 bp. Trimmed reads were filtered to a minimum average base quality of 15. We combined the knownGene, ensGene and refGene annotations for mm10 (downloaded from UCSC Genome Browser) with the full RepeatMasker annotation, also from UCSC Genome Browser, to build a single gene annotation. Redundant transcripts were filtered out using the gffread utility packaged with Cufflinks. The annotation was modified to include a common gene_id value for same-name repeat elements resulting in a total of 875 repeats. Sequences for all annotated features were extracted from the mouse genome and RNA-Seq reads were aligned to them using BBMap with 95% identity, up to a single INDEL and up to 2000 equally best alignments per read. Alignments to features were quantified by counting hits to gene loci and down-weighting read alignments that mapped to multiple gene loci by 1/N2 where N is equal to the number of gene loci. Reads aligned to repeat elements were counted in the same way but instead of using gene loci the repeat name was used for binning hits. If a read mapped to multiple repeat features all of the same name then it was counted as 1 hit to that repeat name. Raw read counts were loaded into R and median normalized for differential expression analysis. For each pair-wise test genes with raw counts less than 10 in all conditions were not tested. Differential expression was performed by testing the null hypothesis that a gene's fold change between conditions is zero. The observed dispersion-mean relationship was fit using a method similar to that of DESeq and the predicted dispersions were used as the minimum dispersion per gene. Fold-changes between conditions were tested by monte-carlo simulation using the observed and estimated means and dispersions to generate random negative binomial distributed count values (the rnbinom method in R). In each monte-carlo iteration N samples were simulated per condition (N = to the number of samples in each condition), averaged into conditions and the log fold-change was calculated. The resulting simulated log fold-change distributions are normally distributed. Z- scores were computed for each observed log fold-change compared to its corresponding monte-carlo simulated fold-change distribution and translated to two-tail p-values against the normal probability distribution. Raw p-values were adjusted using the Benjamini & Hochberg correction. Genes and repeats were tested together and marked significant if the adjusted p-value was less than 0.05. RNA-seq data is deposited at GEO (GSE66547). Oocyte expression data used for comparisons was previously deposited at GEO (GSE33923.) For the heat map plot, each gene found to be significantly associated with PC1 is standardized relative to its mean and scaled relative to its variance (ie each gene is scaled separately to improve visualization.) Each row is a gene which is standardized where mean is zero with standard deviation is 1. This makes each row relative to its mean. The scale is relative to its variance. Rows are sorted by a clustering of the genes. Color scale is relative to mean expression level per gene. Each animal was placed in a mouse housing unit (32.8 × 18.6 × 13.6 cm) with 5/8 inches of bedding. Over an 6 day period, the height of the bedding was measured in inches. In addition, 400 grams of standard mouse diet pellets was placed in each food hopper. The amount of food remaining in the food hopper was weighed each day over a 3 day period. A clean, transparent plastic cage (32.8 × 18.6 × 13.6 cm) was filled 4.5 cm deep with corncob bedding material. 20 glass marbles (20 mm diameter) were evenly spaced in a 5 × 4 grid on the surface of the bedding. During the testing phase, the mice were placed in the cage for 25 min and allowed to explore. At the end of the testing phase, mice were removed from the cage and the number of marbles that were buried 2/3 their height in the bedding were counted. Mice were placed in a clean, transparent plastic cage (55.5 × 32.5 × 19.5 cm) with grid lines marked on bottom of cage. The center area was clearly marked for analysis (27 × 16.2 cm). After 10 min, video was scored for number of times center area was crossed and amount of time spent in center area. Annual Review of Genetics 31:493–525. Briefings in Functional Genomics 9:444–454. Molecular and Cellular Biology 30:4851–4863. Proceedings of the National Academy of Sciences of the United States of America 102:1957–1962. Journal of Biological Chemistry 280:28316–28323. Journal of Biological Chemistry 274:33002–33010. Journal of Biological Chemistry 288:10860–10869. The International Journal of Biochemistry & Cell Biology 67:139–147. Molecular and Cellular Biology 34:1020–1030. Molecular and Cellular Biology 16:4555–4565. Proceedings of the National Academy of Sciences of the United States of America 98:1454–1458. Thank you for submitting your work entitled "Maternally provided LSD1 enables the maternal-to-zygotic transition and prevents defects that manifest postnatally" for peer review at eLife. Your submission has been favorably evaluated by Janet Rossant (Senior editor), a Reviewing editor, and two reviewers, one of whom, Gavin Kelsey, has agreed to share his identity. All agree that the work represents a significant advance however several revisions are recommended. The Reviewing editor has drafted a summary of the reviews to help you prepare a revised submission. In this study, the authors nicely show that deletion of LSD1/KDM1A in oocytes in the mouse (which they do with three different Cre-drivers) causes arrest at the 2-cell stage and gross impairment of zygotic genome activation (as demonstrated by a nicely executed RNA-seq analysis). The mechanistic basis of these effects are not characterised in further detail. The absolute requirement of LSD1 for embryonic progression, implicating the importance of regulation of histone post-translation modifications, is an important observation. The unique aspect of this manuscript, however, is the Lsd1 hypomorph inadvertently produced by the incomplete ablation caused by the Vasa-Cre (paradoxical given the earlier timing of this Cre transgene and remains unexplained). The imperfect ablation of Lsd1 allows some embryos to survive through the critical pre-implantation phase, and then to term and adulthood, although there is another period of attrition at birth. The adult survivors display abnormal behaviours, which are characterised in detail. Again, I think this is a very interesting observation, which points to epigenetic imbalance in the early embryo as having potentially long-term consequences. No doubt, the authors could have chosen other phenotypes to examine, as there is no reason to suspect that the presumed epigenetic defects should be restricted to these few behaviours, but the limited numbers of surviving adults preclude a deeper phenotypic characterisation. With justification, the authors choose to analyse imprinted genes as potential mediators, although I am not aware that the specific imprinted genes examined are implicated in the behaviours tested. 1) I have a problem with the basic experimental design. It seems to me that if one expects developmental failures one should never use superovulated females as a source of the eggs. Eggs and embryos from superovulated females are going to be inferior and any negative developmental effect will be potentiated. I would recommend that at least some of described experiment be repeated using normal matings. In addition, the only significant molecular information in the manuscript is the transcriptome comparison between the maternally deleted and wt 2-cell stage embryos i.e. period of zygotic genome activation (ZGA). However, the ZGA is entirely regulated by the maternally inherited molecules; proteins and RNAs. Proteome comparison would be technically quite difficult but transcriptome comparison between maternally deleted and wt oocyte is possible, necessary and should be included and interpreted in the revised manuscript. Furthermore, cytoplasmic polyadenylation is one of the most important mechanisms controlling the utilization of many maternal mRNAs and it would be very important to determine how it functions during maturation of mutant oocytes and after fertilization in zygotes. In order to supplement the data on the imprinting state of several genes in perinatal pups, it would be necessary to assess and include in the manuscript the imprinting state of the same genes in the ovulated oocytes and zygotes. 2) A major concern is the characterisation of the effects on methylation and expression of imprinted genes in the Lsd1Vasa progeny; this should be improved, especially because the link between effects on methylation and expression do not appear to be well correlated. I think there are obvious ways to improve this and the analysis as presented does not allow strong conclusions. 3) Is it the case that the authors analysed methylation and expression in dead pups (they refer to them as 'exhibiting perinatal lethality)? In which case, how reliable is the RT-qPCR analysis? 4) Do the bisulphite sequencing results take into account clonality? For example, for the Igf2r DMR in MEP1 (Figure 6—figure supplement 1), there appears to be essentially three patterns of methylation: one fully unmethylated sequence, a set of fully methylated sequences and a set of sequences that are partially methylated in an identical pattern. Such a pattern could suggest a high rate of clonality and that very little amplifiable DNA went into the bisulphite reaction or post-bisulphite PCR, perhaps because DNA was degraded in dead pups. Alternatively, the result could suggest something of more biological interest, that these were the three methylation profiles present in cells of the early cleavage embryo at that very limited time window of maternal LSD1 deficiency, and that this limited set of profiles becomes 'fixed' when the embryonic lineage is determined from a small number of blastomeres. I think we need more detail and improved methylation analysis to be able to discriminate between technical issues and biologically interesting interpretation. 5) What tissue is actually assessed? The authors state 'sagittal sections' of the pups. So, is this comparable between the controls and mutants? Is it the case that only one control and two mutant pups were examined (the figure legend states: “All analyses were performed on a staged matched B6/CAST hybrid control pup and 2 maternal effect progeny (MEP) exhibiting perinatal lethality”)? This does not seem adequate for expression level comparison. 6) In the subsection “LSD1 is expressed throughout oocyte development”, finding of incomplete loss of LSD1 is really surprising. In the paper originally describing Vasa-Cre mice, deletion was always observed in all oocytes. The breeding schemes the authors are using indicate that there is only one functional allele of Lsd1 in the target cells, which makes the persistence of LSD1 even more surprising. Considering that Vasa-Cre is most likely expressed in primordial germ cells it is extremely unlikely that, if deletion took place, the LSD1 can persist till ovulation. The authors admit that they cannot explain it, however the question remains if one should leave it like that. The authors can check how efficient deleters are the Vasa-Cre mice they are using (more about mice later) by crossing them with some other fl/fl target strain. In addition, it would be interesting to determine the level of LSD1 in maternally deleted eggs. Is it the same as in heterozygous females or significantly lower? This information would be very important in evaluating the results of behavioural tests. 7) In the first paragraph of the subsection “Loss of maternal LSD1 results in 1-2 cell embryonic arrest”, is the timing of expression of paternal allele known? Please provide experimental evidence or citation. 8) In the first paragraph of the subsection “Loss of maternal LSD1 results in 1-2 cell embryonic arrest”, the development of Lsd1Gdf9 control embryos is very poor. Another example how unrelated/uncontrolled influence can significantly affect experimental results. In view of these results I would suggest deleting all results in which Gdf9-Cre is used. In the last paragraph of the aforementioned subsection, development of embryos from Zp3-Cre crosses is obviously much better than from Gdf9 crosses, strain effect? Another reason to delete Gdf9 results as those two groups should be comparable. 3- and 4-cell stage embryos appear very unhealthy. 9) One note of caution on the behavioural effects is that there could be a potential confound of litter effect, given that factors such as litter size in the early postnatal period could have a programming effect on a variety of adult behaviours – and so could be quite independent of history of Lsd1 deficiency per se – and there is a strong effect on litter size (Figure 4D). Stronger data on the effect on imprinted genes (see above) would help negate a possible confounding effect such as this. 10) From the RNA-seq datasets, the authors comment on mis-regulation of interesting DNA methylation modulators, such as Dnmt1, Tet1, Trim28, Zfp57, Dppa3/Stella in 2-cell embryos from Lsd1Zp3-Cre females. Ideally, these effects would be validated by RT-qPCR. Also, this mis-regulation could be more apparent than real. For example, a two-fold up-regulation of Dnmt1 could represent the same number of oocyte-derived Dnmt1 transcripts, but a reduction in the total mRNA pool in the 2-C embryo owing to impaired zygotic genome activation, so it is a relative rather than absolute change. Thank you for resubmitting your work entitled "Maternally provided LSD1/KDM1A enables the maternal-to-zygotic transition and prevents defects that manifest postnatally" for further consideration at eLife. Your revised article has been favorably evaluated by Janet Rossant (Senior editor), a Reviewing editor, and two reviewers. The manuscript has been improved but there are some remaining issues that need to be addressed before acceptance, as outlined below. These can be addressed without further experimentation, with modifications to the manuscript text or methods. The authors addressed (or attempted to address) most of the comments. They also provided some additional experiments and discussed why some of the requested experiments could not be performed. The arguments (shortage of time, being out of the scope of the investigation, limit imposed by the available number of embryos) seem overall reasonable and justified. The manuscript is of sufficient quality and interest to justify publication in eLife though some additions in the text are necessary. The Discussion is mostly concentrating on relatively trivial and unexplained results dealing with imprinting errors observed in two dead pups. The authors tried to explain the reason for using dead pups and how they controlled for possible artefacts. This explanation is not entirely satisfactory and possible technical problems could explain why two samples significantly differ. I certainly do not see the need to provide so much space in illustrations, results and discussion to this subject. The rest of the Discussion is mostly a repetition of the Results. There is no attempt to speculate about some puzzling observations. The presence of a small amount of protein in supposedly Vasa-Cre mediated deleted oocytes has been partially explained in the authors' reply to reviewers so why not add those thought to the Discussion. The suggestion that a possible reason may be extreme stability of LSD1 protein or RNA is not logical. If this would be the case one would expect to see even more protein or RNA in the oocytes in which deletion happens much later when mediated by Gdf9-Cre and ZP3-Cre. The authors (again in the accompanying letter) state that differences between the Gdf9-Cre and ZP3-Cre experiments may be caused by different locations. They could have easily checked if this is true. As it stands there is a very significant difference and readers may draw all kinds of conclusions from what could be the trivial fact that one lab is better in growing embryos or handling mice. However, it is also possible that the difference is caused by an earlier action of GDF9 which would in turn deprive oocytes of histone demethylase a few days earlier. However if LSD1 protein or RNA is so long lived this explanation is useless. One would really like to see those puzzles discussed a bit better. 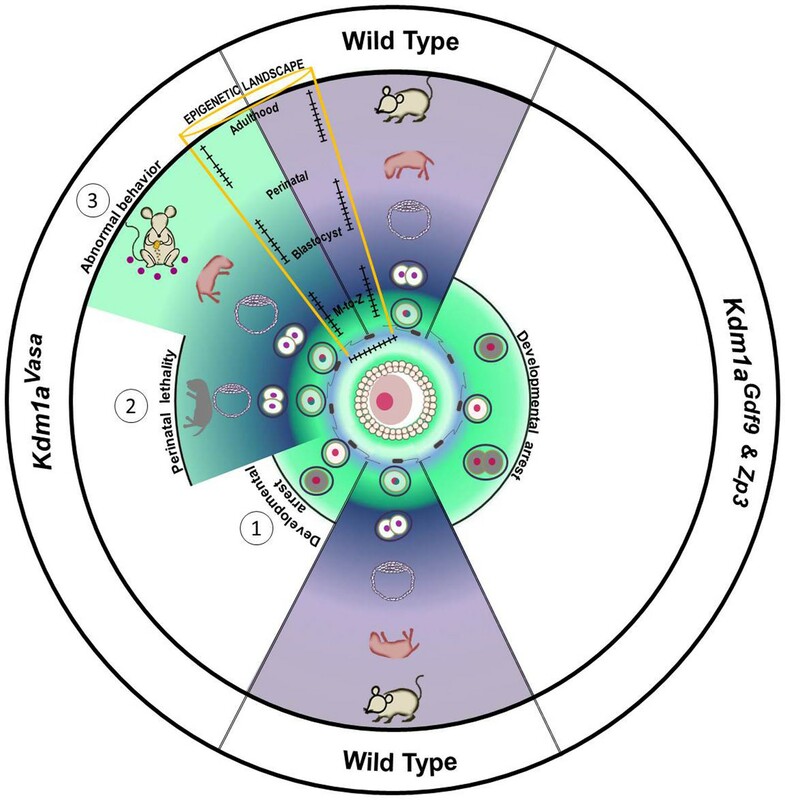 As before, this manuscript on the consequences of ablation of LSD1/KDM1A in mouse oocytes has three components: phenotypic and molecular characterisation of defects in oocytes and preimplantation embryos; description of behavioural effects in rare surviving adult progeny obtained after early maternal germline ablation of LSD1 (Vasa-Cre); and molecular analysis of imprinted genes in pups from such maternal germline mutants. Some connections can be made between these phenotypic outcomes, but they can be considered separate facets of the story. Thus, the reported behavioural defects could be completely unrelated to altered imprinting, but the analysis of imprinted genes offers precedent that maternal lack of LSD1 could give rise to early epigenetic errors that persist into adult life. In the revised manuscript, the characterisation of the molecular defects in early embryos is significantly improved with the addition of the RNA-seq data from Lsd1:Zp3-Cre oocytes. These added data allow the authors to conclude more strongly that there is a defect in zygotic genome activation, since the disruption in gene expression in oocytes is far less extensive. However, whether the ZGA defect depends upon activity of LSD1 in the zygote/embryo or other factors stored in the oocyte that depend upon LSD1 in the oocyte cannot be distinguished. The manuscript from Ancellin et al. addresses this point. Nevertheless, the informatic analysis of the RNA-seq datasets looks very robust. Regarding the behavioural tests, I am not sure the issue of litter size and behavioural effects is fully dealt with. Were the litter sizes similar for the various control groups, given the very small litter sizes of the maternal mutants? The definitive ways to get around possible confound of litter size when there seems to be such a profound effect on litter size would be to reduce the litter size of the controls groups to those of the maternal mutant class, or undertake cross-fostering to ensure control and maternal mutant groups all experience similar postnatal care. In as much as it is not possible to expect the authors to undertake the study in this way now, I do strongly urge them to include explicit statements in the Materials and methods on the postnatal history of the adults, both maternal mutant and control groups, relating to litter size (exact litter sizes for all groups). There remains a potential confounding factor here, and readers need to be able to appreciate it. Specific comments: 1) I have a problem with the basic experimental design. It seems to me that if one expects developmental failures one should never use superovulated females as a source of the eggs. Eggs and embryos from superovulated females are going to be inferior and any negative developmental effect will be potentiated. I would recommend that at least some of described experiment be repeated using normal matings. The Lsd1Zp3 experiments performed to identify the 1-2 cell arrest were originally performed with natural matings. Superovulation was then necessary to get more embryos for subsequent analyses. The text has been amended to more clearly reflect this. In addition, all Lsd1Vasa experiments were performed with natural matings. In addition, the only significant molecular information in the manuscript is the transcriptome comparison between the maternally deleted and wt 2-cell stage embryos i.e. period of zygotic genome activation (ZGA). However, the ZGA is entirely regulated by the maternally inherited molecules; proteins and RNAs. Proteome comparison would be technically quite difficult but transcriptome comparison between maternally deleted and wt oocyte is possible, necessary and should be included and interpreted in the revised manuscript. Furthermore, cytoplasmic polyadenylation is one of the most important mechanisms controlling the utilization of many maternal mRNAs and it would be very important to determine how it functions during maturation of mutant oocytes and after fertilization in zygotes. We agree and have prioritized these studies. We now include RNA-seq analysis of polyadenylated and non- polyadenylated RNAs in Lsd1Zp3 mutant versus control oocytes (Figure 3). This analysis shows that the transcriptome differences between control and Lsd1Zp3 oocytes are much less than the differences between control and Lsd1Zp3 M-Z+ 2C embryos. This finding is consistent with our conclusion that LSD1 functions post-fertilization during the maternal-to-zygotic transition. The new RNA-seq analysis does have some interesting new leads, including the massive upregulation of the Metallothionein1 (Mt1 gene) and the reduction in several mitochondrially encoded genes in Lsd1Zp3 oocytes. This indicates a possible stress response or metabolic deficit in the mutants which we have now indicated in the main text and Discussion. We are currently pursuing these potential Lsd1Zp3 oocyte defects in our ongoing studies. In order to supplement the data on the imprinting state of several genes in perinatal pups, it would be necessary to assess and include in the manuscript the imprinting state of the same genes in the ovulated oocytes and zygotes. This is a good question and was part of the original rationale for these experiments. So we tried very hard to analyze the establishment of maternal imprints in Lsd1Zp3 and Lsd1Vasa mutants, both in oocytes and arrested embryos (in the Katz and Macfarlan Laboratories). Although we could amplify repeat sequences and detected little change in DNA methylation levels in mutants relative to wt, we have been unable to amplify ICR regions from bisulfite treated DNA, even with nested PCR. Importantly, in our new RNA-seq analysis we do not observe imprinted gene expression defects in Lsd1Zp3 oocytes. This provides indirect support that imprints are properly established. We have now assayed DNA methylation at imprinting control regions in a second control neonatal pup (Figure 6). In this second control, imprinting is even more strictly maintained, suggesting that the imprinting defects in Lsd1Vasa pups are not just due to variability. We were unable to obtain additional surviving Lsd1Vasa mutants to improve the analysis on the mutant side. The variability between effects on methylation and expression are consistent with our overall observations that multiple epigenetic enzymes are disrupted. Because of the very limited number of hypomorphic animals and the need to allow viable neonatal pups to develop into adults, the methylation and expression had to be done on sagittal sections of newly deceased pups. In order to minimize the effects of death on these analyses, careful attention was taken to match the death conditions in controls. We also took great care to match sagittal sections. Importantly, we have now provided new RT-PCR data from a second control pup (Figure 6). The new data closely matches the other control, suggesting that the variability in expression that we see in some of Lsd1Vasa pups is likely due to real variability rather than assay conditions. The bisulfite analysis was performed on a large amount of DNA extracted from a sagittal section of a neonatal pup. This minimizes the chances of clonality. In addition, we have verified the lack of clonality using the BiQ analyzer program. Please see responses to points 2 and 3. 6) In the subsection “LSD1 is expressed throughout oocyte development”, finding of incomplete loss of LSD1 is really surprising. In the paper originally describing Vasa-Cre mice, deletion was always observed in all oocytes. The breeding schemes the authors are using indicate that there is only one functional allele of Lsd1 in the target cells, which makes the persistence of LSD1 even more surprising. Considering that Vasa-Cre is most likely expressed in primordial germ cells it is extremely unlikely that, if deletion took place, the LSD1 can persist till ovulation. The authors admit that they cannot explain it, however the question remains if one should leave it like that. The authors can check how efficient deleters are the Vasa-Cre mice they are using (more about mice later) by crossing them with some other fl/fl target strain. Data generated from analysis of this Lsd1 conditonal allele in other tissues (submitted elsewhere) suggests that LSD1 protein (or RNA) can be extremely stable. For example, in some cells, LSD1 is still robustly detected 8 weeks after complete deletion of the floxed allele. Also in our hands, crossing Cre-drivers with different floxed alleles (or in mice from different strains) can lead to different patterns/timing of deletion, often not matching published patterns. For further explanation please see comments below. In addition, it would be interesting to determine the level of LSD1 in maternally deleted eggs. Is it the same as in heterozygous females or significantly lower? This information would be very important in evaluating the results of behavioural tests. The controls for the immunohistochemistry on Lsd1Vasa oocyes in Figure 1 are heterozygotes, suggesting that the “reduced” expression that we quantified is significantly lower than heterozygotes. The Figure 1 legend has been amended to indicate this. Answering this question would require that the maternally mutant embryos be fertilized and develop toward the blastocyst stage, or require RNA analysis of hybrid crosses that contain SNPs to distinguish alleles. However as we show in the manuscript, the maternal mutants do not develop when fertilized by wild-type males. In the occasional embryo that cleaves to the 2C stage, we do not detect Lsd1 transcripts (now shown in Figure 3- figure supplement 3), but this could be due to the lack of full ZGA and may not be due to the lack of transcription from the paternal allele. We have generated RNA from 2C embryos derived from hybrid crosses (CAST/B6), but the Lsd1 allele does not have SNPs, so allele specific expression could not be interrogated. Some of the slight phenotypic differences between Lsd1Zp3 and Lsd1Gdf9 mutants may be due to the fact that the experiments were performed in two difference laboratories (Macfarlan and Katz). As a result, there may be subtle differences in developmental timing, strain background, etc. Nevertheless, we believe that the small differences are real and wish to report the result. To make the manuscript more clear, we have moved the Lsd1Gdf9 results to a supplemental figure and modified the text. Despite the strong effect on litter size in Lsd1Vasa mutants, hypomorphic animals were obtained from litters ranging between 1-4 animals. Nevertheless, the behavior effects were observed in 100% of the animals, regardless of the size of the litter to which they were born. This suggests that the effect is independent of litter size. Text has been added to the manuscript to make this point. We agree. We have performed RT-PCR and added it to the manuscript (Figure 3—figure supplement 4). The RT-PCR data is consistent with the reported RNA-seq data. Reviewer #1: The authors addressed (or attempted to address) most of the comments. They also provided some additional experiments and discussed why some of the requested experiments could not be performed. The arguments (shortage of time, being out of the scope of the investigation, limit imposed by the available number of embryos) seem overall reasonable and justified. The manuscript is of sufficient quality and interest to justify publication in eLife though some additions in the text are necessary. Additional comment: Discussion is mostly concentrating on relatively trivial and unexplained results dealing with imprinting errors observed in two dead pups. The authors tried to explain the reason for using dead pups and how they controlled for possible artefacts. This explanation is not entirely satisfactory and possible technical problems could explain why two samples significantly differ. I certainly do not see the need to provide so much space in illustrations, results and discussion to this subject. The rest of Discussion is mostly repetition of the Results. There is no attempt to speculate about some puzzling observations. Presence of small amount of protein in supposedly Vasa-Cre mediated deleted oocytes has been partially explained in the authors' reply to reviewers so why not add those thought to the discussion. Suggestion that possible reason may be extreme stability of LSD1 protein or RNA is not logical. If this would be the case one would expect to see even more protein or RNA in the oocytes in which deletion happens much later when mediated by Gdf9-Cre and ZP3-Cre. The authors (again in the accompanying letter) state that differences between the Gdf9-Cre and ZP3-Cre experiments may be caused by different locations. They could have easily check if this is true. As it stands there is very significant difference and readers may draw all kinds of conclusions from what could be trivial fact that one lab is better in growing embryos or handling mice. However, it is also possible that the difference is caused by earlier action of GDF9 which would I turn deprive oocytes of histone demethylase few days earlier. However if LSD1 protein or RNA is so long lived this explanation is useless. One would really like to see those puzzles discussed a bit better. Reviewer #2: As before, this manuscript on the consequences of ablation of LSD1/KDM1A in mouse oocytes has three components: phenotypic and molecular characterisation of defects in oocytes and preimplantation embryos; description of behavioural effects in rare surviving adult progeny obtained after early maternal germline ablation of LSD1 (Vasa-Cre); and molecular analysis of imprinted genes in pups from such maternal germline mutants. Some connections can be made between these phenotypic outcomes, but they can be considered separate facets of the story. Thus, the reported behavioural defects could be completely unrelated to altered imprinting, but the analysis of imprinted genes offers precedent that maternal lack of LSD1 could give rise to early epigenetic errors that persist into adult life. In the revised manuscript, the characterisation of the molecular defects in early embryos is significantly improved with the addition of the RNA-seq data from Lsd1:Zp3-Cre oocytes. These added data allow the authors to conclude more strongly that there is a defect in zygotic genome activation, since the disruption in gene expression in oocytes is far less extensive. However, whether the ZGA defect depends upon activity of LSD1 in the zygote/embryo or other factors stored in the oocyte that depend upon LSD1 in the oocyte cannot be distinguished. The manuscript from Ancellin et al., addresses this point. Nevertheless, the informatic analysis of the RNA-seq datasets looks very robust. Regarding the other two main aspects of the manuscript, I retain some concerns. I think the authors could have gone about the expression and methylation analysis in a more robust way. Given the prominence given to this analysis in the manuscript, I would have considered that sacrificing a couple of pups for more refined molecular analysis, rather than relying on the approach adopted of extracting DNA and RNA from histological sections of deceased pups, would have been appropriate. It would have given this analysis far greater credibility: we would have had the confidence that pristine, freshly isolated and defined tissues were being analysed, rather than an aggregation of tissue of unknown quality from a sagittal section. On a side point, regarding the result for Grb10 (Figure 6—figure supplement 1A), it is not clear that the authors are actually looking at the germline DMR, as this region should be fully unmethylated on the paternal allele of control animals, whereas both alleles seem to be fully methylated. (The germline DMR is unmethylated on the paternal allele in all tissues and, as far as I am aware, tissue-specific expression status of Grb10 occurs without changes in the methylation of the germline DMR.) Regarding the behavioural tests, I am not sure the issue of litter size and behavioural effects is fully dealt with. Were the litter sizes similar for the various control groups, given the very small litter sizes of the maternal mutants? The definitive ways to get around possible confound of litter size when there seems to be such a profound effect on litter size would be to reduce the litter size of the controls groups to those of the maternal mutant class, or undertake cross-fostering to ensure control and maternal mutant groups all experience similar postnatal care. In as much as it is not possible to expect the authors to undertake the study in this way now, I do strongly urge them to include explicit statements in the Materials and methods on the postnatal history of the adults, both maternal mutant and control groups, relating to litter size (exact litter sizes for all groups). There remains a potential confounding factor here, and readers need to be able to appreciate it. We thank the reviewers for their helpful suggestions. We agree with the points that they have raised in the new round of reviews and have made all of their suggested changes and additions to the text (largely in the Discussion). In addition, we have removed the confusing Grb10 imprinting data from Figure 6—figure supplement 1 and the corresponding text in the results. Finally, as requested, we have added a new table and text describing the table in the Methods. This new table lists the litter sizes of all perinatal lethal animals and all animals assayed in the behavioral assays. We thank the Transgenic Mouse and Gene Targeting Core Facility (TMF) specifically T. Caspary, T. Quackenbush, K. Piotroska-Nitsche and H. Zhang for their assistance with the superovulation and embryo isolation experiments. Thank you to the Emory DAR for providing animal husbandry, the Dept. of Cell Biology for a wonderful and scientifically stimulating environment, the BCDB program for their continued support and the entire Katz Lab, specifically Michael Christopher and Teresa Lee, as well as T. Caspary for helpful discussions and comments on the manuscript. Thank you to M. Rosenfeld for providing the Kdm1afl//fl mice, D. Castrillon for providing the Vasa-Cre mice, M. Bartolomei for information on verified H19 polymorphisms and primers, S. Gourley and J. Schroeder (the Emory Rodent Behavioral Core) for helpful advice on mouse behavioral assays. Thank you to A.K. and S.K. for providing the marbles. Gdf9-Cre and Zp3-Cre mice were obtained from the Jackson Laboratories (Bar Harbor, ME). J.A.W was supported by the Biochemistry, Cell and Molecular Biology Training Grant (5T32GM008367) and D.A.M by the Emory PREP Post-Bac Program (5R25GM089615-04). The work was supported by a grant to D.J.K from the National Science Foundation (IOS1354998). T.S.M. is supported by Eunice Kennedy Shriver National Institute of Child Health and Human Development DIR grant HD008933. Animal experimentation: All mouse work was performed under the approved guidelines of the Emory University IACUC (protocol #2002534). Upon fertilization, the highly specialised sperm and oocyte genomes are remodelled to confer totipotency. The mechanisms of the dramatic reprogramming events that occur have remained unknown, and presumed roles of histone modifying enzymes are just starting to be elucidated. Here, we explore the function of the oocyte-inherited pool of a histone H3K4 and K9 demethylase, LSD1/KDM1A during early mouse development. KDM1A deficiency results in developmental arrest by the two-cell stage, accompanied by dramatic and stepwise alterations in H3K9 and H3K4 methylation patterns. At the transcriptional level, the switch of the maternal-to-zygotic transition fails to be induced properly and LINE-1 retrotransposons are not properly silenced. We propose that KDM1A plays critical roles in establishing the correct epigenetic landscape of the zygote upon fertilization, in preserving genome integrity and in initiating new patterns of genome expression that drive early mouse development.